A "stakeholder" is anyone who has an interest in the value that the organisation creates. Stakeholders may be Owners, Customers, Sponsors, Employees, Volunteers, Government Agencies, The Wider Community and other organisations in the same sport (e.g. parent bodies). In developing strategic plans, including the most basic element "the mission statement", organisations must set objectives that are derived from the needs of its principal stakeholders. Sport and recreation organisations have "owners". The owners of a sport organisation that is profit-orientated are shareholders while non-profit organisations have members. All sport organisations, profit and non-profit, have customers. If the organisation is a non-profit association, its members are also its customers to whom it supplies services. Commercial organisations provide sponsorship monies and seek a return on their investment in the form of promotion and publicity benefits for their company name and products. Government agencies provide sponsorship to recreation organisations and also seek a return on their investment in the form of benefits for the community. Unlike other industries, the sport and recreation industry has a large dependency on volunteers. Sport organisations commonly have less than five employees and in many cases they function purely with volunteers. The community in which a sport organisation exists is also a stakeholder in the strategic planning process. Sport organisations must ensure that the services provided are relevant to the community's needs. Furthermore communities tend to invest in sport organisations through funding by local municipal government. Particularly in the sport sector, most organisations will be stakeholders in another organisation in the same sport. 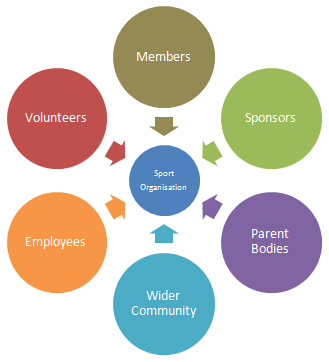 For example, the figure on the right illustrates the hierarchy of sport organisations. A state football association will be a stakeholder in the national football federation and at the same time a stakeholder in the various district football associations in the same state. A factor of this mutual stakeholder relationship is that each organisation must provide value to other stakeholders.